Carrier-borne aircraft operations have always been a dangerous business. With the increase in available speed and weight brought by the development of the jet engine, they were to become even more dangerous. By the close of WWII, the Admiralty had already foreseen that research would be required into the changes necessary during the transition from piston-engined aircraft to jets. One of the more unusual ideas was to save weight and cut down landing accidents by having undercarriage-less aircraft. They would be launched by a special catapult and would land on a flexible rubber deck. 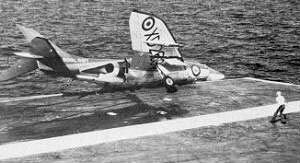 Trials were even carried out with a mock deck at Farnborough, using Sea Vampire aircraft. After initial setbacks the concept proved practical - just about, but even so, the Admiralty abandoned the idea. One of the better decisions in UK defence procurement! Supermarine had been developing a single-seat fighter aircraft to use flexible decks, the type 505. When the Admiralty lost interest, the 505 was modified to use a conventional retractable undercarriage, becoming the type 508. This was a straight-winged twin-engined jet with 'butterfly' (V-shaped) tail (in an attempt to keep the tailplane clear of the jet exhaust and away from the deck). Originally three were to be built, but as always things changed and while the second differed in detail and in having cannons installed (being designated the type 529 as a result), the third underwent a large number of changes with swept wings, a conventional swept tailfin instead of the v-tail and various other changes. 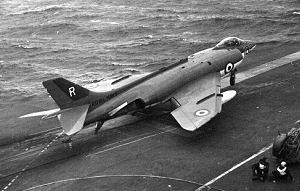 This later aircraft looked much more like a Scimitar ancestor, and was designated the type 525. First flown on 27th April 1954, the aircraft provided valuable information for the Scimitar development. A de-navalised version known as the type 526 was offered to the RAF but they were not interested. Then, during a normal test flight on 5th July 1955, the 525 entered a spin at 10,000 ft which deteriorated into a flat spin from which the pilot, Lt. Cdr. Rickell, could not recover. Experiencing problems with jettisoning the canopy and operating the ejector seat, unfortunately he ejected too late and the seat did not have time to separate, nor did the parachute have time to fully deploy - he was killed on impact with the ground. The aircraft was completely destroyed. It would be an indicator of things to come. An order was placed for 100 production aircraft based on the type 525, to be designated N113. Supermarine developed the 525 further, producing the new designation of type 544. The single-seat fighter specification had been changed also; now the aircraft was to be a low level strike aircraft with nuclear capability (no doubt as a result of test pilot reports on the 508/529/525s - which were generally not complimentary about its abilities as a fighter). The fighter/interceptor role would now be fulfilled by the de Havilland DH.110 design. The type 544, like its predecessors, was powered by Rolls Royce Avons and these were, for the time, hugely powerful engines with lots of excess thrust available. Vickers made use of this with a flap blowing system - redirecting part of the high pressure air from the engine through thin slots ahead of the flaps. This delayed the onset of boundary layer separation at low speeds, basically enabling the wing to continue to fly in a stable manner at speeds much lower than normal. This allowed slower - and safer - approach speeds when landing, highly desirable for the demanding business of landing on a tiny carrier deck. The first N113 flew on 19th January 1956 and was quickly followed by two more. Deck trials on HMS Ark Royal began in April but the first two N113s were not particularly representative of the final Scimitar so more trials were planned for early 1957. Meanwhile, trials continued. The power of the twin Avon engines was amply demonstrated when one pilot made a successful take-off with the parking brake still on! In January 1957, the more representative 3rd N113, WW134, began trials on Ark Royal. This aircraft was strengthened for the new low-level role and had various aerodynamic 'fixes' applied such as flared-out wingtips and wing fences, to try and counter pitch-up effects at high speed and altitude (similar problems having previously been experienced with the Swift). The tailplane was also changed from having dihedral (angled up) to anhedral (angled down). The N113's powered controls caused some concern when it was realised the high roll rates made possible could cause structural damage. However, the strengthening introduced for the low level role was found to be sufficient to allay these fears. The first Scimitar proper came off the production line in January too, and flew on the 11th. While the first production Scimitar was retained for some time by Supermarine to continue trials and development, the navy was busy figuring out how best to evaluate the new aircraft. A new unit, 700X Flight (part of 700 NAS), was formed to carry out the task. Deliveries of Scimitars to 700X at Royal Naval Air Station Ford began in August 1957 and the squadron carried out their evaluation task in an intensively noisy fashion until late May 1958. For the residents of this small West Sussex village, the arrival of the hugely powerful Scimitar was an unwelcome shock after the relatively quiet Attackers, Sea Hawks and Gannets they had been used to prior to this point (and about which a near constant stream of complaints were already being received). 700X's intensive flight operations with the type won them few friends with the locals, but enabled a quick and relatively painless introduction of the Scimitar into front line service. The locals ended up with peace and quiet as the air station closed later that year - and an open prison was built on it. Most would have preferred to keep the Scimitars! Early experience with the type found that the view over the nose was generally good but could be improved when in the nose-high landing attitude - the only significant shape change to the airframe was the result, with a slimmer (and considerably more attractive) nose cone being fitted as standard. A similarly styled nose with various cameras could also be fitted for photo reconaissance operations. The first frontline Scimitar squadron to be formed was 803 NAS. After working up at RNAS Lossiemouth and participating in the 1960 Farnborough SBAC show, they embarked on HMS Victorious. Unfortunately, 803's commanding officer was killed in a landing accident when his aircraft went over the side and sank before he could escape, in full view of the assembled press who splashed photos of the trapped pilot over the next day's front pages. While the incident would bring in much improved underwater escape training, it would only be the first in a long line of Scimitar losses (though this first one was due to arrestor wire failure, not a problem with the aircraft). 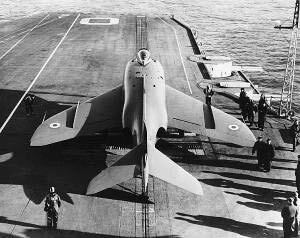 The Scimitar was, at the time of its introduction, the heaviest and most powerful aircraft ever to serve in the Fleet Air Arm. While innovations such as angled decks helped, the situation with these large and fast aircraft and small aircraft carriers meant that take-offs and landings were an increasingly dangerous business. While the Americans simply built bigger carriers, this luxury was not available to the RN, which was becoming increasingly pressurised to save money, not spend it. The Scimitar's design included a tail bumper so that the aircraft could be rested on it for take-off, with the nosewheel high in the air, actually off the deck. The increased angle of attack meant the less powerful catapults on the RN's small carriers could still manage to bring a heavy (and heavily loaded) aircraft like the Scimitar to flying speed. The margins, however, were tight and there was little room for error. Accidents began to mount up - hydraulic failures, in-flight fires, landing accidents by the dozen, ditchings and plain old crashes. The general consensus these days is that the RN was simply not experienced enough in operating such an advanced and heavy aircraft. The limited size of the carriers also meant that landing accidents became far more serious than they would otherwise have been. In all, 76 Scimitars were actually produced (the last batch of 24 having been cancelled), and no less than 39 were lost in a variety of accidents - an attrition rate of over 51% over the Scimitar's service life! Also worrying was the increasing workload on the single pilot during long low-level strike missions (the two-seat Scimitar having been dropped at an early stage). The accidents and workload worries did not, however, stop the Scimitar squadrons from putting on some spectacular airshow appearances. Even in their first year of squadron service, Scimitars put on a stunning show at the 1959 Farnborough SBAC show, which included a variety of role demos including one Scimitar using an extended arrestor hook to pick up a banner target from the runway. The 'twinkle roll' was also born at that show - when aircraft fly in formation and all quickly roll simultaneously. Later shows would see increasingly large formations of Scimitars, with nine being shown off in the 1961 show. The type's early career, before full air to ground weapons fit was approved, involved a lot of 'fun flying' - relatively light weight payloads, a high performance jet and the whole ethos of the elite single seat fighter set meant a Scimitar posting was a glamorous and sought-after job. Scimitars never saw any action, though they did help prevent a possible war when the Royal Navy was sent to the Gulf to block the increasingly hostile Iraqis from invading Kuwait in 1961. They were also prepared for a basic ground attack role using guns only in the Indonesian campaign. Trials work with various weapon types saw a succession of lethal objects hung underneath Scimitars including 2 and 3 inch unguided rockets, 500 and 1000 lb bombs, AGM-45 Bullpup air to ground guided missiles (described by pilots as great fun, but utterly useless as a weapon of war due to the requirement to fly along after it once fired to guide it, thus putting the aircraft into just as much danger as simply going in and bombing the target) and AIM-9 Sidewinder air to air missiles for self-defence (the Sea Vixen was entering service by now and taking over the fighter role). The carriage of a single nuclear bomb - the nominally 2,000 lb (actually 1,750 lb) Red Beard - was also trialled successfully, and practice of the appropriate release techniques with dummy 'shapes' was carried out from time to time, and also regularly practiced with much smaller practice bombs. The real weapons were never flown by carrier-based Scimitars, as the risks of a take off or landing accident were felt to be too high to risk 'live' practice sorties in peacetime - indeed the weapons were stored in component form aboard the carriers for safety, and permission to assemble them was never given in peacetime. Each aircraft carrier rarely had more than a handful of such weapons. Soon, however, the increasing difficulty of the low-level attack role with what was a fairly basic navigation system, and the type's mounting losses meant that the navy relegated the Scimitar to 2nd-line duties while the much more capable Blackburn Buccaneer was brought into service. The Buccaneer Mk.1's underpowered engines meant that early Buccaneers could not take off with a full load of fuel and weapons, so Scimitars were used to provide 'buddy' refuelling; that way the Buccaneers could take off with minimum fuel and save their precious thrust for carrying a respectable weapon load! Other duties for Scimitars in their last months of service were towing target banners, providing radar targets for calibration of ground-based radar sets and a myriad of other unglamorous but essential roles. The last frontline squadron (803 NAS) relinquished their Scimitars in October 1966. The Fleet Requirements Unit (FRU, later FRADU) operated Scimitars using civilian pilots for a time too; from 1965 to the end of 1970. So it was that December 1970 saw the last flight of the last Supermarine fighter. Despite the appalling accident rate, the Scimitar was generally well thought of by its pilots and has been described by many as 'a delight to fly' - at least below 25,000 ft - above that, the limitations that gave it a very short life in the fighter role became painfully apparent and handling was much less carefree than at low level. Scimitar maintainers did not have to undergo the pain of some of their RAF counterparts on types such as the Lightning; though the complex fuel system generated leaks by the dozen and hydraulic problems kept them busy, in general the type was straightforward to maintain. It was certainly a more successful design than Supermarine's other swept wing jet - the Swift. * Lengths are for standard nose cone and do not include instrumentation boom on early aircraft or IFR probe on later ones. Heights are with wings spread and aircraft on jacks with undercarriage legs at full extension and wheels just touching the ground.